When you join the DSXpressCLOUD you simply get an extraordinary application that allows you to build an elaborate Digital Signage or Kiosk presentation. 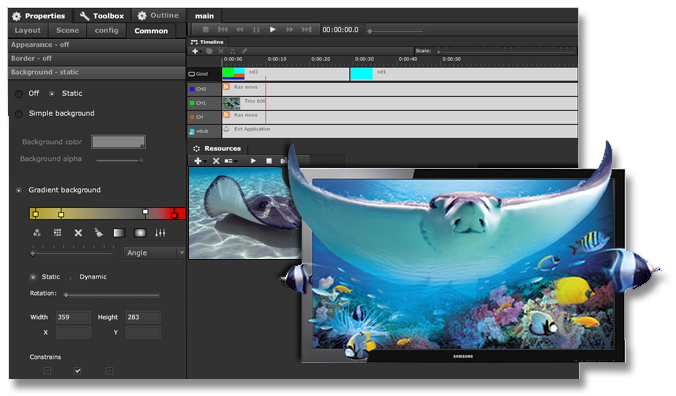 Use advanced components like HTML web integration, Live TV, HD videos, Flash animations and more. The web forever changed how people consume, share, discover and connect around content. And Digital Signage based on software as as service benefits from all the same things we love about the web. You no longer have to worry about servers or complicated network maintenance, no expensive hardware to buy and best of all, your software is always up-to-date running the latest features and enhancements. 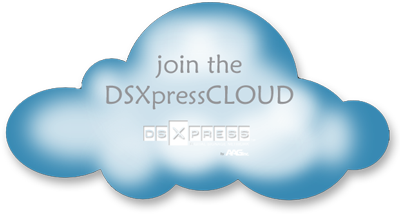 DSXpressCLOUD and Software as a Service (SaaS) or "Cloud Hosting" has been creating quite a buzz. You might be hearing the phrase for the first time but the technology is not something new. Cloud hosting benefits the users from various angles. It’s scalability and cost efficiency are the commonly recognized advantages. Digital Signage and cloud computing is a marriage made in heaven. With cloud computing you can let us do do all the technical work while you can focus on your business strategy and sales. Cloud computing is already here. When you use services like Gmail, NetFlix or Salesforce you are essentially already taking advantage of the cloud; without having to worry about what’s happening in the background. So why not use the same model for Digital Signage? With DSXpressSignage you can focus on managing screens and SignagePlayers while we maintain the server, thus reducing a significant expense from your overall digital signage operating cost. DSXpressCLOUD is the quickest, most cost-effective way of developing truly dynamic content for YOUR digital signage network and managing any number of remote screens. It’s the simple process of creating a professional presentation on your computer, and pushing it down to any number of remote screens; it’s that simple. When you open a new account on the DSXpressSignage platform, our management system will automatically associate your account with the server that’s geographically closest to you. This means faster downloads and a more responsive work flow for both you and your audience. Our SignagePlayer Desktop version caches all the content locally. So even if a server is being worked on, your screen will never go down and the complete transition will be transparent to your audience. When the server is brought back up, the SignagePlayer will automatically reach to the cloud and check for new updates which you may have submitted while the server was maintained. In real-estate it’s all about location, in the cloud it’s all about security. Securing the cloud is fundamental to its success. It is a core component in the DSXpressSignage digital signage network. Information is safely and securely stored and accessed through an authorized process called public / private key encryption process. Cloud computing is a good alternative to a private hosted server, and while there are bad people out there, keeping your data in the cloud safe and secure is our #1 job. So now you know. Cloud computing is already here. More companies are transitioning into the cloud because it makes economic sense. Let us maintain the infrastructure while you can focus on content creation, management and sales.